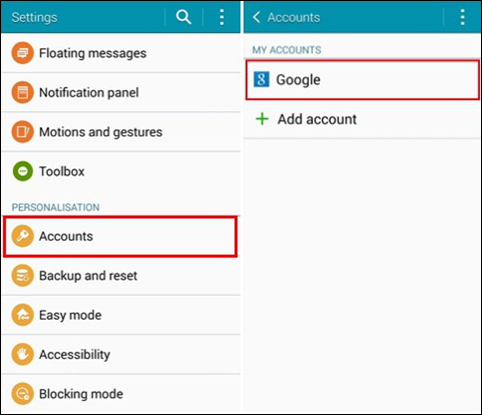 How do I Remove a Google account from my android phone? 1. Go to Settings> Accounts> Google, I am assuming you see your account(s) out there, right? 2. If so, then tap on one Gmail account. It should take you to a SYNC SETTINGS page where you are supposed to be able to remove an account. 3. Hit the menu key on your phone that has three lines which should be at the bottom of your phone on the left side of your button, which will then pull up the delete account menu option on the bottom left of the screen (Or some models will show three dots on the top right corner to list the “Remove account” option as below). 4. When you tap on “Remove account”, you will get a pop-up message to confirm it. 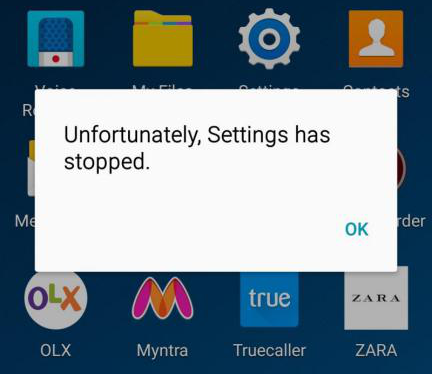 When some users go to Settings> Accounts> Google, and try to hit the Google icon to access the account, they receive the pop-up message: “Unfortunately Settings has stopped”, then they get put back to the main Settings page. If you are confronted with this situation, I would like to suggest you opening the stock gallery app, press the menu button and then click on Settings to access the Google sync options. 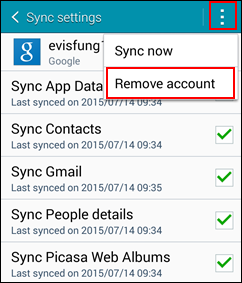 Now you can access the Google account sync options from there. If there is an annoying Sign-in request notification, get rid of it. Go to your Gallery App > hit the Menu button > select CONTENT TO DISPLAY where you can disable the Picasa option (when you get rid of the useless accounts, you can re-enable that option if you want to see your Google+/Picasa pictures in your Gallery). If none of the above work, try long-pressing on the account while in the account screen or hitting the menu button in that screen to see if you get an extra menu. Go to Settings > General > Security > Device Administrators, and figure out if there is anything there that might be associated with the accounts. If so, that might be preventing you from removing them. After that, go back and check whether you can see the three dots/menu key or not.